One of the first snacks suggested for Snack-Girl was toast. It is simple, versatile, and if you choose right, a healthy choice. 1. Is the first ingredient WHOLE grain? If it isn't then put it back on the shelf. Do not be fooled by the ingredient "wheat flour". The whole grain means that most of the nutrients remain from the grain remain in the bread. Without it, you might as well eat Wonder Bread (which is wonderful but not nutritious). 2. Does it have at least 3 grams of fiber per serving? Eating foods that are high in fiber will help keep you feeling fuller for longer. Bread is an excellent source of fiber if it is made with whole grains. The Arnold bread was in the bread aisle and cost me $2.99 for the loaf. It was on sale from $3.99. The Alvarado Street Bakery bread was in the "Natural Foods" section and cost me $2.89 because I had a coupon. (I LOVE coupons!!) The Alvarado bread usually costs $3.49 a loaf. It is a sprouted bread which is fantastic from a nutritional perspective. 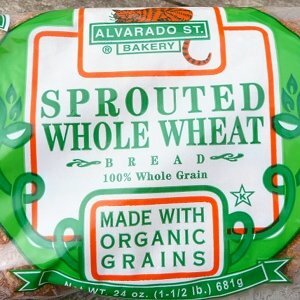 Why is a sprouted bread better? "We take whole, organic wheat berries and soak them in filtered water until they "sprout", until they actually begin to grow...The sprouting process naturally converts starchy grains into easily digested maltose and other complex sugars. There is enzyme activity created during germination that begins to "pre-digest" the grains, thereby making the grains and their nutrients and vitamins more readily assimilated by the body." Basically, you are using the whole wheat berry and not grinding into a flour. You retain a bunch of nutrients! Bread keeps well in the freezer, so if there is a sale on an expensive loaf be sure to stock up. The Arnold brand was sweeter and lighter than the Alvarado brand which was crunchier. I liked the Alvarado bread better because it had more texture. BUT, toast is really a vehicle for something yummy to spread on it. Here is a list 330 Ways to Enjoy Toast for your perusal. People get pretty crazy with their toast! I added a link to my toaster below. It is a Cuisinart and it is SO much better than the $10 toasters I used to buy at Walgreens. It has lasted almost 5 years and shows no sign of giving out even though we use it almost every day. I LOVE this toaster. What is your favorite brand of bread and what do you spread on it? Good points. I think also important to brush up on ingredients and know where fiber is coming from. If you see "inulin or multidextrin" these are added fibers not naturally present in grain. Also "enriched" is a sign something has been added back that was likely stripped from the grain. My fave bread company? French Meadow breads! I second the ezekial bread. It is very good and "clean." My favourite bread is a loaf of multigrain from a local bakery just a few blocks from my place- they use organic, all-natural, local ingredients. I don't buy commercial bread anymore- I figure it's worth it to spend a couple extra $$ to get bread from the bakery where it's freshly made with ingredients I can pronounce! Plus the taste is phenomenal. Discovering this helps me to become a more selective and critical shopper..my newest discovery is Natures Own 100 whole wheat Sandwhich rounds $2.49/pkg .It advertises that it has 20mg whole grain per roll and 5 gms of fiber per roll. At 100 calories per roll and a Flat bread like appearance makes it a versitile choice to pack for lunch at work.It fits in a toaster perfectly for toasting.I first used it for hamburgers...Arnold $2.99/pkg and Pepperidge farms $2.99/pkg have simular products. These all sound yummy - but I know my kids would say "yuck." As a compromise, I sometimes by the Wonder Whole Wheat White. Don't shoot me! I know it is stripped of all the good stuff, and then something is added back in. BUT... it does seem slightly better than the plain old white bread if that's what your kids like. Also, on the bread theme - I like the Thomas' Better Start Whole Wheat English muffins - again, enriched whole wheat flour, NOT whole grain - but 100 cal / 8g fiber - 1 WW point. 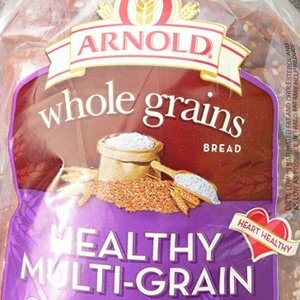 Recently, I've discovered a good bread by Arnold -- whole wheat Family bread. Good protein and fiber, although a bit higher on the sugars. My kids like it. We also use Nature's Own 100% Whole Wheat bread. Neither of these has high fructose corn syrup, as some other breads do. And really, WHY would a bread need high fructose corn syrup? !! If you haven't experienced Trader Joe's and you have one in your area, it's a real treat. LOVE your blog, lots of great info, thanks! I am a bit confused- does the bread have to say "whole grains" or can it say "whole wheat flour." The way I am understanding it is that it has to have "whole" in front of "grain, flour, etc" to actually be whole grain. But if it says just "wheat flour" then it is bad. Right? Dave's Killer Bread! So good and full of fiber! On the pricier side, so only when it is on special or I buy it at Costco. Maria, lol! Don't let anyone make you feel guilty about the Wonder Bread! Kids make their parents buy all kinds of less-than-ideal foods ... sometimes you do just have to pick the lesser of two evils, just so they'll eat SOMETHING! Dave's Killer Bread - Good Seed is amazing. 3 point plus per slice and it's worth the points. It's full of fiber and has a great nutty chew. It's the best. Nature's Own Double Fiber Wheat. 5 grams fiber per slice and points plus value of 1 per slice? I think I figured this correctly. Taste however, is nothing to brag about---I use it in soups. Can be found most everywhere. @Kathy, I buy my Oroweat "Healthfull" bread @ Walmart. It is a $1.00- $1.50 cheaper than Sfwy. (the only other choice of Grocery store in the town I live in)It is the only bread I buy, & it is full of fiber. Only 1 point. For many years I was under the assumption that buying bread as whole wheat was the way to go. Now I understand, having read & having my daughter tell me, that whole grain is it. Always good to keep learning!! lOVE THE WEBSITE! HANDS DOWN: Dave's Killer Breads! 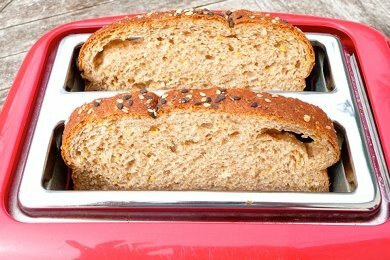 His breads are so delicious, nutritious and even the light versions are wonderful! Not one piece of cardboard in the whole bunch of loaves.